I was quite happy to get responses to yesterday’s post regarding my difficulty with taking photographs of Trilliuim that were both helpful and humorous. Today, I thought I would show a close up image of the flower and talk a little more about Trillium in general. I think this shot really portrays the feel and shape of the flower. With the advice I got, I also hope to be able to portray them as they live in their ‘community’. I will let everyone know when they finally do emerge here. It is usually at the end of March or beginning of April. I also wanted to mention an entry that I read on someone else’s blog. I would surely provide a link if I could only remember where I read it. At any rate, the post really demonstrated to me how the internet has shortened the distance between people and how it also lets us more clearly appreciate geographical differences. This particular post dealt with the author seeing someone picking a Trillium flower in the Pacific Northwest. Apparently, it was noted, these flowers are not very common there at all and, in fact, are protected by law. They grow by the truckload here, and I was surprised by how limited my vision was to think that they must therefore be plentiful all over. It was a bit eye opening to see just how centrist I could be, particularly since I consider myself quite 'conservation minded'. By the way, I am not at all implying that the flowers should or could be picked here just because they are plentiful! The flowers are meant to be where they are naturally growing, and if anyone wants some they can purchase cultivated plants. Of interest, a quick internet search tells me the flowers are also protected in Western Canada and, although I couldn’t find a specific reference, I believe they are protected in large portions, if not all of, the US as well. 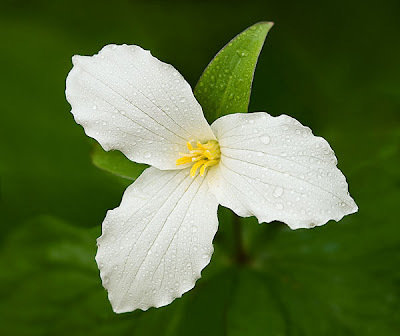 Addendum: Just before posting this I found one more interesting web page about Trillium which includes information about its protection as well as about how its seed is spread. That page is here.